Are you a ministry leader or do you assist one? Do you wonder how to take your service to the next level? Designed for personal or group study,this unique and concise guide offers assistants and leaders sturdy tools to build effective and fruitful partnerships.Experienced assistant Karen Hawkins outlines the purpose, calling, and responsibilities of assistants while offering sound, practical advice for leaders on how to maximize assistant/leader relationships. Whether you think of yourself as a manager, a secretary, an executive assistant, or an armor-bearer, Assistants and Leaders will inspire you to serve God's kingdom in new and more effective ways. "Assistants keep our lives together and make the machinery of our office actually work. 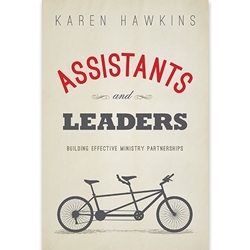 Karen Hawkins has done an amazing job as just one of those assistants for a long time, and has a lot to share in this great tool you hold in your hands. I highly recommend it." "This book provides valuable insight and excellent input on how to maximize the relationship between a CEO and his/her assistant in order to reach their greatest working potential." "Every influential leader needs a good administrator, communicator, and humble assistant. Karen Hawkins has proven herself to be a gracious servant leader. . . . In prayer, she has received God's heart for the leaders she serves. She now shares these valuable insights with other assistants and those they serve." "This booklet is a veritable gold mine, chock-full of time-tested principles that Karen developed as she assisted me during the past fifteen years. It is a must-read for both leaders and their assistants."